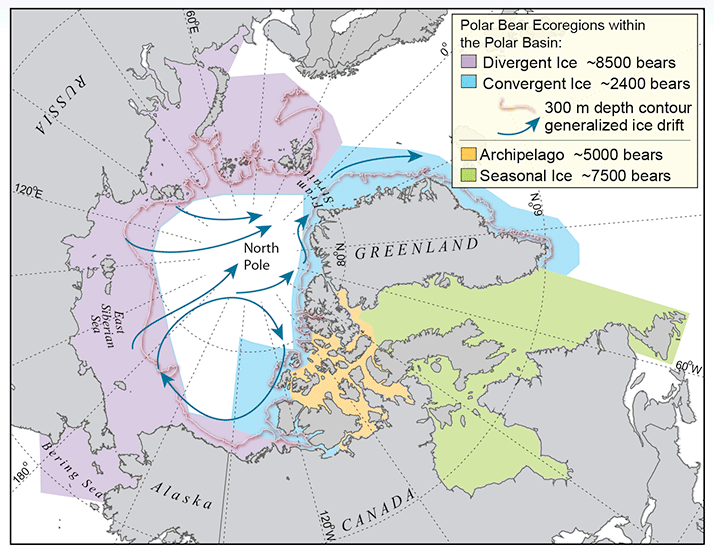 Polar bear ecoregions, reflecting major patterns in sea ice and associated polar bear life history (Amstrup and others, 2008). In the seasonal ice ecoregion, sea ice melts completely in summer and all polar bears must be on land. In the divergent ice ecoregion, sea ice pulls away from the coast in summer, and polar bears must be on land or stay with the ice as it recedes north. In the convergent and archipelago ecoregions, sea ice is generally retained during the summer. The Arctic is warming faster than other regions of the world due to the loss of snow and ice, which increases the amount of solar energy absorbed by the region. The most visible consequence has been the rapid decline in sea ice over the last 3 decades—a decline projected to bring long ice-free summers if greenhouse gas (GHG) emissions are not significantly reduced. The polar bear (Ursus maritimus) depends on sea ice over the biologically productive continental shelves of the Arctic Ocean as a platform for hunting seals. In 2008, the U.S. Fish and Wildlife Service listed the polar bear as threatened under the Endangered Species Act (ESA) due to the threat posed by sea ice loss. The polar bear was the first species to be listed due to forecasted population declines from climate change. Evaluating the influence of different threats to populations provides a framework for recovery planning. To this end, the USGS adapted a model previously used to forecast the future status of polar bears in each of four ecoregions comprising their current circumpolar range. In the first generation model, polar bears were projected to have high probabilities of being lost by mid-century from two of the four ecoregions, where approximately two-thirds of the world’s polar bears presently live (Amstrup and others, 2008, 2010). The new model (Atwood and others, 2015) used updated information to evaluate a wide range of threats and the effectiveness of management actions to address them. The model was structured so specific threats could be individually evaluated. Effects of some threats on polar bears, such as trans-Arctic shipping and disease, are poorly understood. In these cases the model relied on expert opinion, whereas for most other threats, including sea ice loss, data were available to inform the model structure and outcomes. The model used current sea ice projections from the Intergovernmental Panel on Climate Change (IPCC) for two GHG pathways: (1) stabilized—meaning new policies and technologies act to reduce GHG emissions, and (2) unabated— meaning humans continue to increase GHG emissions at current rates. New findings on regional variation in polar bear response to sea ice loss also were incorporated. If present levels of global carbon dioxide (CO2) emissions were to be significantly reduced (left, RCP 4.5), radiative forcing would stabilize (right), but if emissions continue unabated (left, RCP 8.5), so will global warming (right). Updated polar bear outcomes through the end of the 21st century for each ecoregion under stabilized and unabated GHG forcing pathways. “4.5” refers to the 4.5 Representative Concentration Pathway (RCP) and “8.5” refers to the 8.5 RCP as defined by the IPCC in its Fifth Assessment Report (AR5) in 2014. Polar bear outcomes are expected to worsen over time through the end of the century under both GHG pathways. Under the unabated pathway, the time for polar bear populations in two of four ecoregions to reach a “greatly decreased” state was accelerated by about 25 years. Under the stabilized pathway, where GHG emissions peak around 2040 then decline rapidly, only the polar bear populations in the Archipelago Ecoregion never reached a high probability of “greatly decreased,” reinforcing earlier suggestions of this ecoregion’s potential as an important refuge for sea ice-associated life. The most influential drivers of negative polar bear outcomes were declines in sea ice and the marine prey base. Population outcomes were only slightly improved by decreasing mortality from hunting and defense of life. Minimizing stressors, such as trans-Arctic shipping, oil and gas exploration, disease, and contaminants, had negligible effects on model outcomes. The negative effects of sea ice loss for polar bears became more pronounced as the summer ice-free period lengthened beyond 4 months, which could occur throughout much of the Arctic basin during the latter one-half of this century under the unabated pathway. When sea ice completely melts during summer, polar bears must come to land where they have limited access to their primary prey—ice seals. Exploitation of available terrestrial foods while on land is unlikely to help polar bear populations adapt to sea ice loss (Rode and others, 2015). Management of threats other than GHG emissions may serve to slow the transition of polar bear populations to progressively worsened outcomes. Reducing emissions and keeping human-caused radiative forcing under 4.5 Watts per square meter (the stabilized pathway) will reduce threats to the species’ long-term persistence. The most optimistic prognosis for polar bears will require immediate reductions of GHG emissions to keep forcing under 3.5 Watts per square meter. Well-fed male polar bear, Chukchi Sea, Alaska. Polar bears have the highest fat diet of any mammal and can store large amounts of fat as a reserve for fasting periods. Based on physiological constraints, being without food for 4 months or longer is likely to have adverse effects on polar bear reproduction and survival (Molnar and others, 2010; Robbins and others, 2012). Amstrup, S.C., DeWeaver, E.T., Douglas, D.C., Marcot, B.G., Durner, G.M., Bitz, C.M., and Bailey, D.A., 2010, Greenhouse gas mitigation can reduce sea ice loss and increase polar bear persistence: Nature, v. 468, p. 955–960. Amstrup, S.C., Marcot, B.G., and Douglas, D.C., 2008, A Bayesian network modeling approach to forecasting the 21st century worldwide status of polar bears, in DeWeaver, E.T., Bitz, C.M., and Tremblay, L-B., eds., Arctic sea ice decline—Observations, projections, mechanisms, and implications: Washington, D.C., American Geophysical Union Geophysical Monograph No. 180. Atwood, T.C., Marcot, B.G., Douglas, D.C., Amstrup, S.C., Rode, K.D., Durner, G.M., and Bromaghin, J.F., 2015, Evaluating and ranking threats to the long-term persistence of polar bears: U.S. Geological Survey Open-File Report 2014-1254, 114 p., http:// dx.doi.org/10.3133/ofr20141254. Molnár, P.K., Derocher, A.E., Thiemann, G.W., and Lewis, M.A., 2010, Predicting survival, reproduction and abundance of polar bears under climate change: Biological Conservation, v. 143, p. 1612-1622. Robbins, C.T., Lopez-Alfaro, C., Rode, K.D., Tøien, Ø., and Nelson, L.O., 2012, Hibernation and seasonal fasting in bears: the energetic costs and consequences for polar bears: Journal of Mammalogy, v. 93, p. 1493-1503. Rode, K.D., Robbins, C.T., Nelson, L., and Amstrup, S.C., 2015, Can polar bears use terrestrial foods to offset lost ice-based hunting opportunities? : Frontiers in Ecology and the Environment, v. 13, p. 138-145. 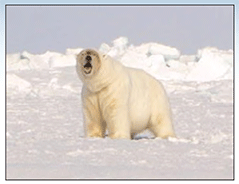 Oakley, K., Atwood, T., Douglas, D., Rode, K., and Whalen, M., 2015, Changing Arctic Ecosystems—Updated forecast: Reducing carbon dioxide (CO2) emissions required to improve polar bear outlook: U.S. Geological Survey Fact Sheet 2015–3042, 2 p., https://dx.doi.org/10.3133/fs20153042.